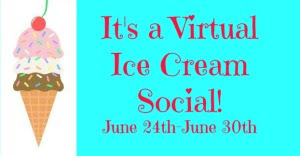 Hi, I'm Deb from Cooking On the Front Burner and am excited today to be guest posting at Carrie's blog as part of her Virtual Ice Cream Social Week! I've known Carrie for awhile now and her blog is a great place to come for some wonderful recipes, Marvelous Monday and of course, my favorite, the Spiked! Recipe Challenge. In fact, I can't wait to see what the ingredient will be for July.... (and I was thrilled when my Strawberry Margarita Shortcake was selected as a top pick last month). Now that summer is officially here, one of our favorite things to do is go out for a scoop or two. I'm not picky - I like Dairy Queen, Culvers, Cold Stone, Flapdoodles (local) or even an occasional cone from Mickey D's! But now..... I own this! Since this was the first time I was using it, I decided on plain vanilla to play it safe! I was very pleased with the results and now thinking of other flavors to try next. 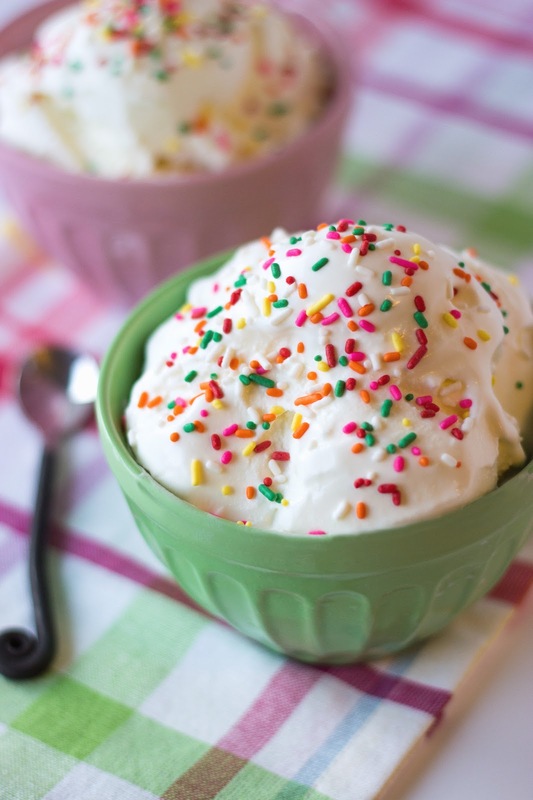 I do love sprinkles so I think that jazzed it up a bit... do you? Thanks so much Carrie for having me!! Hope you all have a great summer! 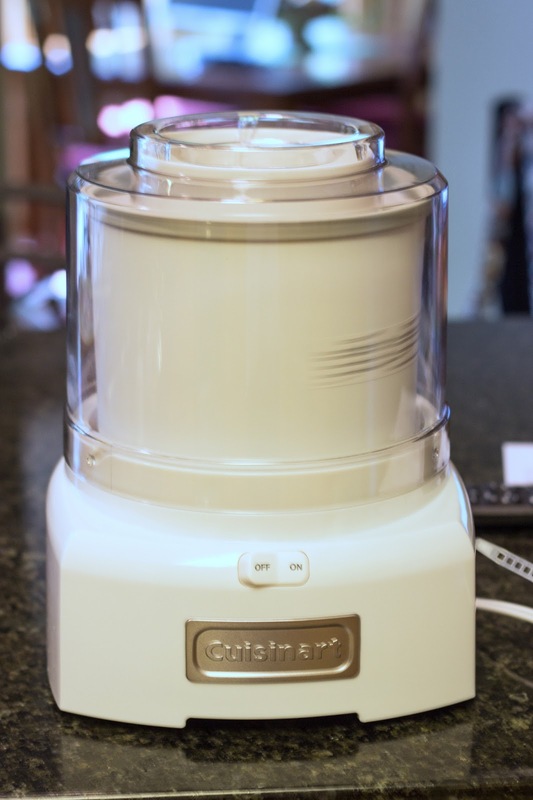 Be sure to check out my Tips & Tricks for Making Homemade Ice Cream, my recipe for Put the Key Lime in the Coconut Ice Cream, and get entered below to win a Nostalgic Electrics Ice Cream Maker (the very same one I own!) 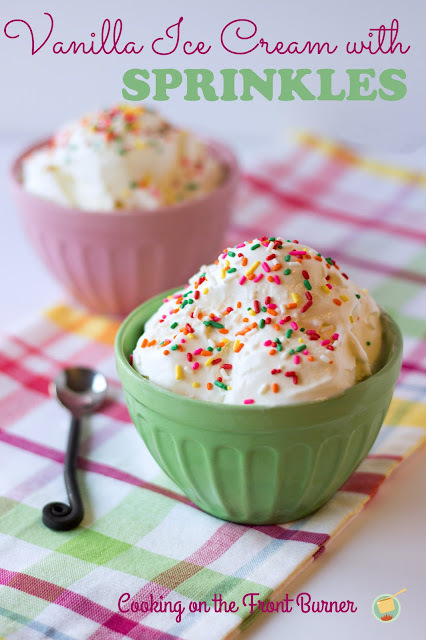 and a copy of The Perfect Scoop! !